One of the biggest challenges singles and couples struggle with when cooking at home is grocery shopping. It's hard to plan out what you're going to buy, how much of it to buy, and how much time in your week you have to run to the store. On average, I go to the store about 1-2 a week. I tend to pick ingredients that have a longer shelf life (frozen bread, eggs, yogurt, cheese, carrots), and buy smaller amounts of ingredients that have a shorter shelf life (fruit, fresh herbs, greens). For Collin and me, we spend on average around $80-100/week and that includes breakfast, lunch and most dinners. These are the main staple ingredients that I buy on a weekly basis. 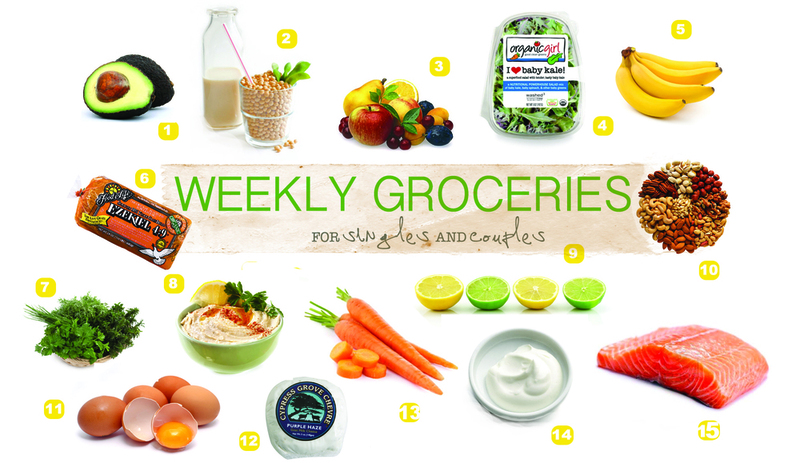 Combine this list with some pantry essentials (coming next week!) and you will always have a meal at your fingertips. I always store a couple avocados somewhere -- they're also filling and packed with healthy fats. Soymilk is a great option for those who are vegan and lactose-intolerrant. Baby Kale and Spinach are great raw and cooked -- any leftovers at the end of the week can be thrown in a stir-fry, pasta or soup. Bananas are great for after workout snacks and any ripe bananas can be frozen for later use. Sprouted bread is more nutrient dense than many of the processed breads you find at the store. More bang for your buck in terms of vitamins and nutrients. Herbs are the key to adding freshness and flavor to a dish. I often use green onions, cilantro, parsley and basil. Any leftover herbs can be blended with EVOO to make a nice marinade or frozen in ice cube trays for stir-frys and salads. Hummus is so versatile. Use it as a dip with fresh veggies or as a spread for wraps and sandwiches. It's packed with protein and keeps you satisfied without the guilt. Citrus the right way to start your mornings. Mother says always wake up with a warm glass of water with a squeeze of lemon -- it serves as a great cleanser and immunity booster! Leftover citrus can be juiced and frozen for long term storage. Nuts are a healthy way to jazz up a salad or dish and most nuts can last for up to 6 months or longer if kept under proper conditions! Eggs are great for breakfast, lunch and dinner. Enough said! Finding a local egg farmer is a great way to support small businesses while getting a better product. Cheese is a guilty pleasure of mine. Don't buy too much as it should be a "treat" on your dishes. Those who are lactose intolerant, goat cheese is a great option. Explore and visit a local cheesemonger and explore some great cheeses from all over the World. Carrots are great and under appreciated. It's certainly one of my favorite vegetables -- raw, roasted, steamed, stir-fryed -- they also last for up to a month in the fridge! Yogurt is great for breakfast, drinks, desserts, and as a topping for many dishes. Because it contains living cultures, it's helps aid in healthy digestion. It can last for 1-2 weeks in the fridge and up to 2 months in the freezer. Meat should be enjoyed in moderation. Most weeks fish is the main choice but chicken and beef are also popular favorites. Meat is best fresh so if possible, buy the day of cooking.